Mount Vesuvius rises through the haze across the Bay of Naples. 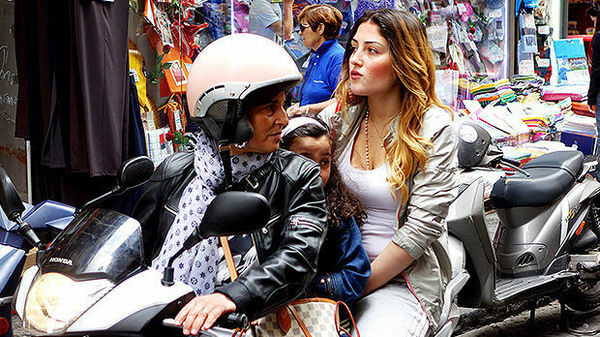 Up-close-and-personal encounters with Vespa riders is what Naples is all about. 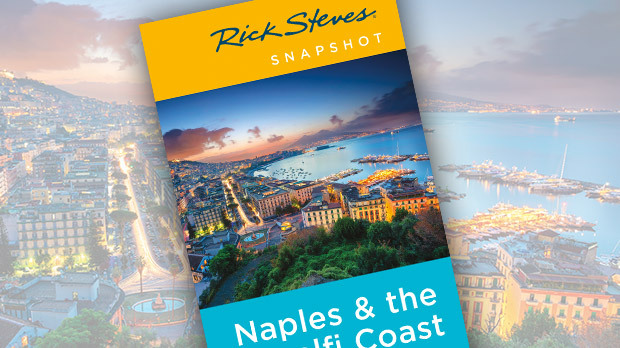 Naples Bay rounds out any trip to Italy with an antipasto misto of travel thrills. Serene Sorrento, an hour south of Naples' urban intensity, is a great home base and the gateway to the much-drooled-over Amalfi Coast. From the jet-setting island of Capri to the stunning Amalfi towns, from ancient Pompeii to even more ancient Paestum, this is Italy's coast with the most. Naples is Italy in the extreme — its best (birthplace of pizza and Sophia Loren) and its worst (home of the Camorra, Naples' "family" of organized crime). 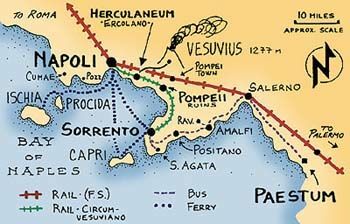 For a blitz tour from Rome, you could have breakfast on the early Rome–Naples express train (about 7:00–9:00), do Naples and Pompeii in a day, and be back in Rome in time for Letterman. That's exhausting, but more memorable than a fourth day in Rome. In the afternoon, Naples' street life slows and many sights close as the temperature soars. The city comes back to life in the early evening. Sorrento, wedged on a ledge between the mountains and the Mediterranean, is an attractive resort of 20,000 residents and — in the summer — as many tourists. It's as well-located for regional sightseeing as it is a pleasant place to stay and stroll. The Sorrentines have gone out of their way to create a completely safe and relaxed place for tourists to spend money. Everyone seems to speak fluent English and work for the Chamber of Commerce. Spritzed by lemon and olive groves, this gateway to the Amalfi Coast has an unspoiled old quarter, a lively main shopping street, a spectacular cliffside setting, and easy public transportation. The Amalfi Coast offers one of the world's great bus rides: The coastal trip from Sorrento to Salerno will leave your mouth open and your film exposed. You'll gain respect for the Italian engineers who built the road — and even more respect for the bus drivers who drive it. As you hyperventilate, notice how the Mediterranean, a sheer 500-foot drop below, twinkles. If you need a destination, consider Positano, an easy day trip from Sorrento. Specializing in scenery and sand, the town of Positano hangs halfway between Sorrento and Amalfi town on the most spectacular stretch of the coast. A three-star sight from a distance, Positano is a pleasant (if expensive) gathering of women's clothing stores and cafés, with a good but pebbly beach. There's little to do here but enjoy the beach and views and window-shop. Capri, made famous as the vacation hideaway of Roman emperors Augustus and Tiberius, is today a world-class tourist trap where gawky tourists search for the rich and famous but find only their prices. A quick boat ride from Sorrento, this four-mile-by-two-mile "Island of Dreams" is a zoo in July and August. Other times of year it provides a relaxing and scenic break from the cultural gauntlet of Italy. While Capri has some Roman ruins and an interesting 14th-century Carthusian monastery, its chief attraction is its famous Blue Grotto and its best activity is a scenic hike. When touring Pompeii, remember this was a booming trading city. Most streets would have been lined with stalls and jammed with customers from sunup to sundown. Chariots vied for street space with shoppers, and many streets were off-limits to chariots during shopping hours (you'll still see street signs with pictures of men carrying vases — this meant pedestrians only). Pompeii's best art is in the Naples Archaeological Museum. Vesuvius, mainland Europe's only active volcano, has been sleeping restlessly since 1944. Complete your Pompeii or Herculaneum experience by scaling the volcano that made them famous. The 4,000-foot summit of Vesuvius is accessible by car, bus, or taxi. From the bus and car park, it's a steep, often cold and windy 30-minute hike to the top for a sweeping view of the Bay of Naples. Up here, it's desolate and lunar-like. The rocks are hot. Walk the entire crater lip for the most interesting views; the far end overlooks Pompeii. Be still and alone to hear the wind and tumbling rocks in the crater. Any steam? Vesuvius is closed when erupting. Paestum is one of the best collections of Greek temples anywhere — and certainly the most accessible to Western Europe. Serenely situated, it's surrounded by fields and wildflowers and a modest commercial strip. 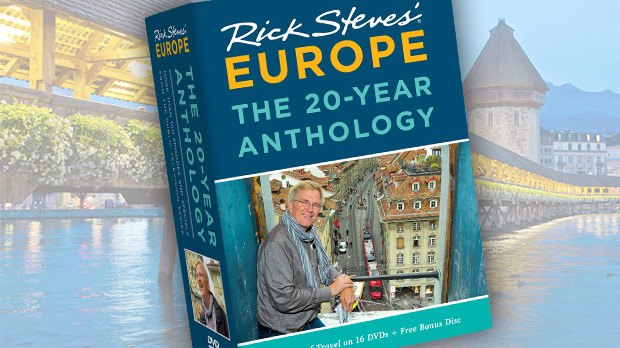 Founded by the Greeks in the sixth century B.C., it was a key stop on an important trade route. It was conquered first by Romans in the third century B.C. and later by malaria-carrying mosquitoes that kept the site wonderfully desolate for nearly a thousand years. Rediscovered in the 18th century, Paestum today offers the only well-preserved Greek ruins north of Sicily. Twenty-five hundred years ago, Naples or Neapolis ("new city") was a thriving Greek commercial center. Two centuries ago, it was the capital of its own kingdom — a "Paris of the south." Then, locals lament, after it joined the newly united Italy, its riches were swallowed up by the new country. As Naples' wealth was used to fund the industrial expansion in the north, it lost its status and glamour. Nevertheless, it remains southern Italy's leading city, offering a fascinating collection of museums, churches, and eclectic architecture. Overcome your fear of being run down or ripped off long enough to talk with people: Enjoy a few smiles and jokes with the man running the neighborhood tripe shop or the woman taking her day-care class on a walk through the traffic. Ask a local about the New Year's Eve tradition of tossing chipped dinner plates off of balconies into the streets. For a quick visit, start with the Archaeological Museum, explore a few streets, and celebrate your survival with pizza. Naples' Archaeological Museum offers the closest possible peek into the artistic jewelry boxes of Pompeii and Herculaneum. The actual sights, while impressive, are barren. The best frescoes and mosaics ended up here. The Secret Room displays R-rated Roman "bedroom" art. A museum highlight is the Farnese Collection — a giant hall of huge, bright, and wonderfully restored statues excavated from Rome's Baths of Caracalla. You can almost hear the Toro Farnese snorting. This largest intact statue from antiquity (a third-century copy of a Hellenistic original) was carved out of one piece of marble and restored by Michelangelo. You name it, it occurs right on the streets today, as it has since ancient times. People ooze from crusty corners. Black-and-white death announcements add to the clutter on the walls. Widows sell cigarettes from buckets. For a peek behind the scenes in the shade of wet laundry, venture down a few side streets. Buy two carrots as a gift for the woman on the fifth floor if she'll lower her bucket to pick them up. The neighborhood action seems best around 18:00. 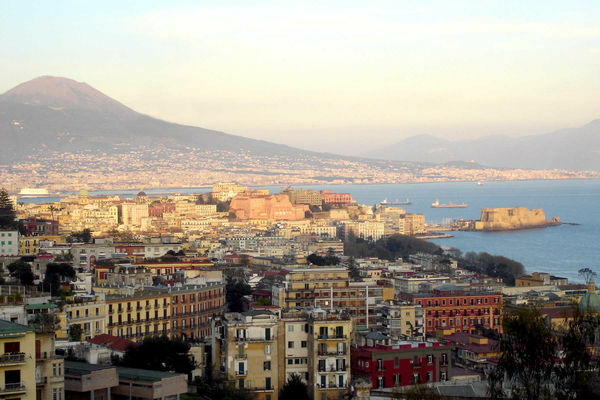 The pulse of Italy throbs in Naples. This tangled mess — the closest thing to "reality travel" you'll find in western Europe — still somehow manages to breathe, laugh, and sing...with a captivating Italian accent.